The Palestinian call for Boycott, Divestment and Sanctions (BDS) of Israel has been endorsed by two US delegations recently returned from fact finding missions to occupied Palestine and Israel. 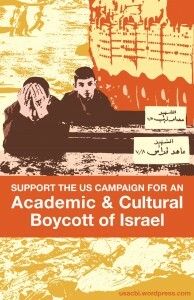 … Israel has consistently closed Palestinian universities under security pretexts and restrictions on freedom of movement mean that it is often very difficult for students to attend universities; international and Palestinian scholars living abroad are denied visas for faculty appointments in the occupied territories. Furthermore, some 80 students from Birzeit University are held in Israeli prisons and detention centers, 10 of whom are currently being held without charge or trial. The delegation also reported that Israel thwarts Palestinian research capacities by restricting imports of equipment necessary for teaching basic science and engineering. It is all but impossible for Gaza students to attend West Bank universities, or for scholars from Ramallah, Gaza City, and East Jerusalem to meet in the same room. We believe that the perpetuation of the international travesty of colonial occupation in a post-colonial world must be brought to an end. For it ultimately threatens the rights, dignity and security of everyone who believes in self-determination, equal justice and human rights. Read USACBI's full press release here. A diverse group of academics, artists, and cultural workers from the LGBTIQ (lesbian, gay, bisexual, transgender, interest, and queer) community also traveled to Palestine/Israel in January. Upon their return to the US, the delegation released an open letter and petition emphatically endorsing BDS and calling on the queer community and its allies to "stand in solidarity with queer and other Palestinians and progressive Israelis who are working to end the occupation; oppose the state of Israel's practice of pinkwashing; and support efforts on the part of Palestinians to achieve full self-determination including building an international Boycott, Divestment, and Sanctions (BDS) movement." Key to Israel's pinkwashing campaign is the manipulative and false labeling of Israeli culture as gay-friendly and Palestinian culture as homophobic. It is our view that comparisons of this sort are both inaccurate - homophobia and transphobia are to be found throughout Palestinian and Israeli society - and that this is beside the point: Israel's illegal occupation of Palestine cannot be somehow justified or excused by its purportedly tolerant treatment of some sectors of its own population. We stand in solidarity with Palestinian queer organizations like Al Qaws and Palestinian Queers for Boycott, Divestment, and Sanctions (PQBDS) whose work continues to impact queer Palestinians and all Palestinians. ▪	The right of return for displaced Palestinians. ▪	The recognition and restoration of the equal rights of citizenship for Israeli citizens of Palestinian descent. Darnell L. Moore, who traveled to Palestine as part of the LGBTIQ delegation and is an editorial collective member of The Feminist Wire (TFW), solicited reflections and commentaries from US-based scholars, activists and cultural workers about their experiences in Palestine. Those writings have been collected and published online at TFW Forum on Palestine. Several participants from the USACBI and LGBTIQ delegations contributed moving and thoughtful pieces to the forum, including powerful commentaries from Neferti X.M. Tadiar and Jasbir K. Puar. Tadiar calls upon us to "forge new relations beyond the province of interests and inherited forms of social belonging to which we might have become tethered and, for those of us not already called, to feel the suffering and aspirations of Palestinians as also our own," in "Why the Question of Palestine is a Feminist Concern." Puar's piece, "The Golden Handcuffs of Gay Rights: How Pinkwashing Distorts Both LGBTIQ and Anti-Occupation Activism," offers insightful analysis of Israel's pinkwashing agenda, homonationalism and the radical impact of Palestinian Queers for BDS (PQBDS) on Palestinian society. She argues that by "foregrounding the Occupation as its primary site of struggle, PQBDS is slowly, strategically and carefully insisting upon and creating systemic and thorough changes in the terms of Palestinian society itself. "